Immanuel Community Services operates a Food Bank that serves approximately 325-400 clients (120-150 families) per month. We are open each Monday, from 11:00 am – 1:00 pm. Anyone who is hungry and needs food is welcome. Without any restrictions about where people live or what their financial situation may be. Many clients come to our food bank to supplement the food that they can’t afford to purchase at the grocery store. 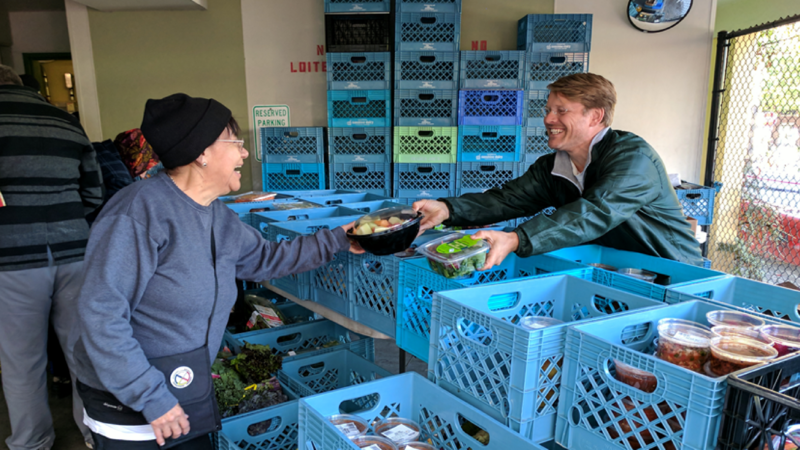 Many of our clients are on fixed incomes and while some do receive food stamps, this is not enough to provide adequate nutrition throughout the month, and we offer supplemental food to clients’ dwindling pantries. This comes as a welcome relief to many. This is all accomplished with strong support from NW Harvest, Food Lifeline, Solid Ground and the Food Resource Network Federation. We also partner with Trader Joe’s, Metropolitan Market, Kai Market and Whole Foods for donations. Many local businesses, schools, apartments and organizations also organize food drives throughout the year to help us keep our shelves full. We have many dedicated volunteers who work so hard to keep food coming in as fast as it is going out. Without the many volunteer hands involved with this process, we could not afford to make our food bank such a success. Volunteers are always needed and welcomed. Please click GET INVOLVED! to learn more.